Like a sad dumb dog who still hopefully visits the grave of his dear, departed master, every once in a while I try Amarok 2 again. Unfortunately, there has been no improvement in usability since the last dozen times I checked. It's pretty nice. It's about as close as you can get to a stable, fully-functional Amarok 1.4-ish player nowadays. Aside from looking good, Exaile is good at handling ID3 tags (a few Japanese tags that Amarok 2 displays as ??????? ?, Exaile displays properly) and it's pretty fast to rescan my collection nowadays, which is nice. It does fairly sane grouping of multi-artist albums under "Various artists". It supports moodbar and song lyrics and cover art fetching and such, if that's the kind of thing you enjoy. It even splits the library display by the first letter of the artist names, just like Amarok 1.4 did, which is awesome. I did have some problems installing the dependencies (python bindings for webkit?) for some of the plugins, but oh well. I figured it out. Today I went so far as to install gnome-settings-daemon and gnome-control-center just so Exaile wouldn't look like crap. I use KDE4, and I haven't touched Gnome or any Gnome libs in a few years, so this is saying something. Mark Kretschmann, an Amarok dev, recently wrote an article about the paradox of choice, in which he said (probably correctly) that being presented with too many options and too many choices end up paralyzing people and making them miserable. I really do believe there's a good program buried somewhere in that mess of controls, desperately wanting to be free. You could put in a feature request. Check out my amarok 2.2.2. How's that one for you? Whoops, I accidentally cut my screenshot, but I think you can get the idea. Oh, and some captcha you have: it's only asked me to type in 'cows' so far. If you group by Album, and an album has tracks by two different artists, only one artist is displayed (incorrectly). I discovered that feature recently. Where is Disc number? Where is Rating, or Playcount? Have fun getting that to display properly and look good. 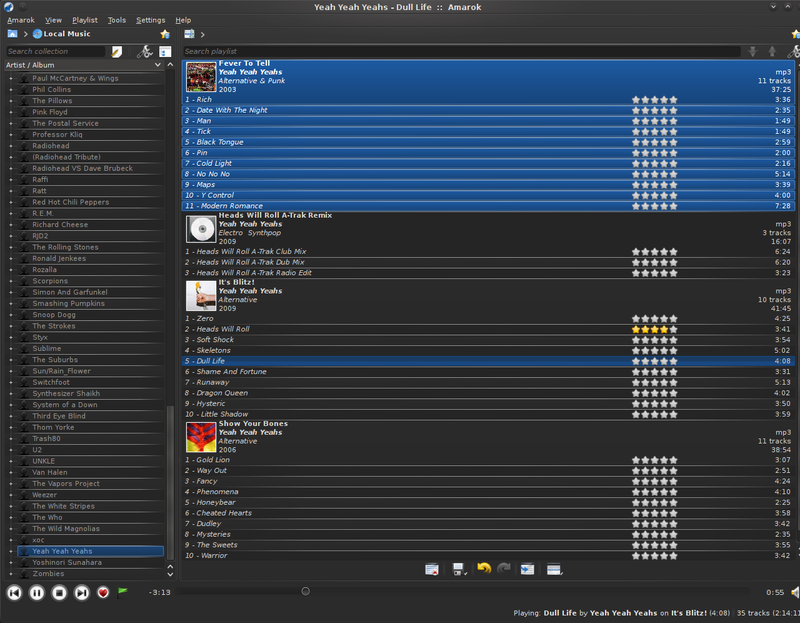 See how in Exaile, nearly all of the playlist area actually displays information about the playlist? Most of your playlist is useless whitespace. I had a vaguely similar Amarok 2 setup that looked sort of like Amarok 1.4, but it took me an hour to set up, broke when I resized the Amarok window, and it was clunky to manipulate. Exaile (like Amarok 1.4) worked properly with no effort. How long did you have to screw around with Amarok before you got it to look OK? Getting your GUI to be functional shouldn't require hard work on your part. Actually the "random", "repeat", and the third button next to it in Exile are strong "WHAT IS THIS?" contenders in my book, as is the "Context" tab. You're right though, much less confusion going on in Exaile. The Context tab is only there if you activate the plugin for it, disabled by default. Yeah that third button is the one confusing part of the Exaile interface. It's for "dynamic playlists". I've never clicked it. Excuse me but all GTK apps look very -- how should I put it -- static! To me, they seem as if they have been coded by very "strict" developers, for want of a better word. It just makes me very uncomfortable and it feels cagey and claustrophobic ... much like I feel when using Windows! Dude. Tooltip calling. Read me, I heard it helps. PS: What is it with the cows? I have seen the tooltips, of course, and I know what most of those buttons do. That wasn't my point; the point is the interface is so busy and so non-standard that it's nearly overwhleming, and I shouldn't have to go around laboriously popping up tooltips and searching for functionality and memorizing the locations of things. How many normal people (i.e. not me) do you think are willing to do that? Great article. I totally agree. Thanks for pointing the dissatisfactory UI issues.